Rev. 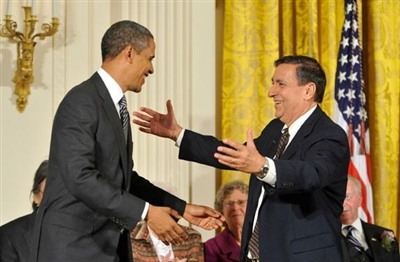 Roberto Perez is congratulated by President Obama on receiving one of 13 2011 Presidential Citizens Medals. Traveling to the Council of Bishops at Lake Junaluska in October, the Rev. Roberto Perez carried his Citizens Medal of Honor with him. Although he wasn’t told what, there was something planned to recognize the prestigious honor bestowed upon Perez Oct. 20, 2011 by President Obama at the White House. He was modest about the gold eagle medallion and award given to him for his longtime leadership and commitment as president of Alfalit, a Miami-based non-profit organization which promotes literacy worldwide. “I feel what I have done is what every Christian should do, and many persons share in this with me,” said Perez, who also said that his wife had warned him not to lose the medal because “I lose everything.” All joking aside, Perez lauded the many people in the Florida Conference, including retired Bishop J. Lloyd Knox, for steady volunteer and financial commitment to Alfalit, which celebrates its 50th anniversary this year. Since its inception, Alfalit volunteers have taught more than seven million people around the world to read and write. “I told the President that the medal belongs to many, and he said that he could only invite one of us,” said Perez, who was one of only 13 to be honored with the nation’s second-highest civilian honor this year. Over 6,000 people had been nominated, but Perez caught the eye of the President. Perez was nominated by Raquel Hickey, who attends First UMC of Coral Gables where Perez serves as associate pastor. In honoring the recipients, President Obama praised the group. “This year’s recipients of the Citizens Medal come from different backgrounds, but they share a commitment to a cause greater than themselves,” he said. “They exemplify the best of what it means to be an American, and I am honored to be able to offer them a small token of our appreciation.” The Citizens Medal was established in 1969 to recognize American citizens who have performed exemplary deeds of service for their country or their fellow citizens. In May, the President called on members of the public to nominate such people in their lives, and Hickey nominated Perez. 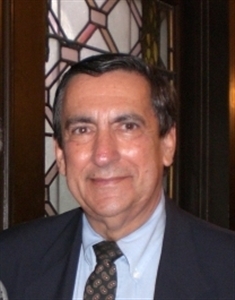 Growing up in Cuba, Perez attended the church where Bishop Knox was then a missionary. “He is my spiritual mentor,” said Perez, who also cited his mother as a direct influence on his life as a Methodist, a pastor and a volunteer. “My mother cooked for the poor, did mission work and worked for the women’s society. She showed me the way,” he said. After Perez came to the U.S., served in the armed services and went to school, he wound up in Miami where he worked at Riverside UMC and helped start a rehab program for youthful first offenders for drugs. Through the years, he has worked with refugees and helped promote Hispanic churches. He attended training by the Alfalit program in the late 1967 and then used the knowledge to counsel prison inmates and teach people how to read and write. He also became a chaplain at the Dade city jail and got involved with inmates. “I have seen the need for literacy as a lot of these people drop out of school…I remember when I came to the U.S.; I didn’t know any English and couldn’t read the signs, so I saw the need,” he said. One of the great things about the program, he said, is that it starts with a reading primer and continues on to the Bible, so those who learn will come to know Christ. Brazil, Argentina, Angola, and Uganda--- 24 countries all over the world have been involved with Alfalit and although Perez is glad to be associated with the organization, he gives all the credit for the work to those who came before him to found and support it.